No, that title is not a typo. And no, you will not get arrested for cutting your Christmas tree down at a national forest as long as you do it in a national forest that allows the cutting of holiday trees and as long as you purchase a permit. 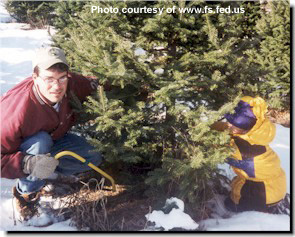 The United States Forest Service sells thousands of holiday tree cutting permits every year to thin out trees in the forests which helps prevent forest fires. But don't think taking a trek through a national forest to find a tree is going to be the same as going to a tree farm to cut down a tree because unlike those nice tree farms, the trees in the national forest are not in perfect straight lines with all other brush and trees removed; nor are you provided with a saw for cutting the tree down or a way to haul it back to your vehicle. But that doesn't mean it's not a fun family outing. A person just needs to be prepared. When cutting a holiday tree in a national forest be sure to pack water and food (and maybe a thermos of hot chocolate) because you may take quite a long walk to find the "perfect" tree in the snowy woods. You'll also need a hand saw to cut down the tree; along with a a tarp and rope for hauling it back to your vehicle or campsite; and rope for securing it to your vehicle. Snowshoes might also come in handy. Remember that every national forest has different rules and regulations but many of them issue holiday tree cutting permits through the middle to latter part of December. To find out if the national forest in your area sells permits and to find out the cost and dates you're allowed to participate, go to the US Forest Service website, use the drop down menu to find a national forest in your area and then either use the "contact us" button to contact officials at the forest or check out its home page to see if it has any information about holiday tree cutting. I checked to see if permits were available at the Chequamegon National Forest in Wisconsin. I went to the forest's home page and then clicked on "winter activities" where I found out they sell permits for cutting down holiday trees for just $5 per tree (the cost does vary but I think a permit costs less than $15 in most parts of the U.S.). You could turn a tree cutting expedition into a camping trip as well. Check to see if the national forest in your area allows winter camping and turn your tree hunting excursion into a memory making camping weekend!